Google Unveils New Products, Flexes Muscles To Competitors And Regulators : All Tech Considered Google unveils a litany of products at the developers' conference, including messaging apps, a personal virtual assistant and a voice-controlled speaker that connects you with it. 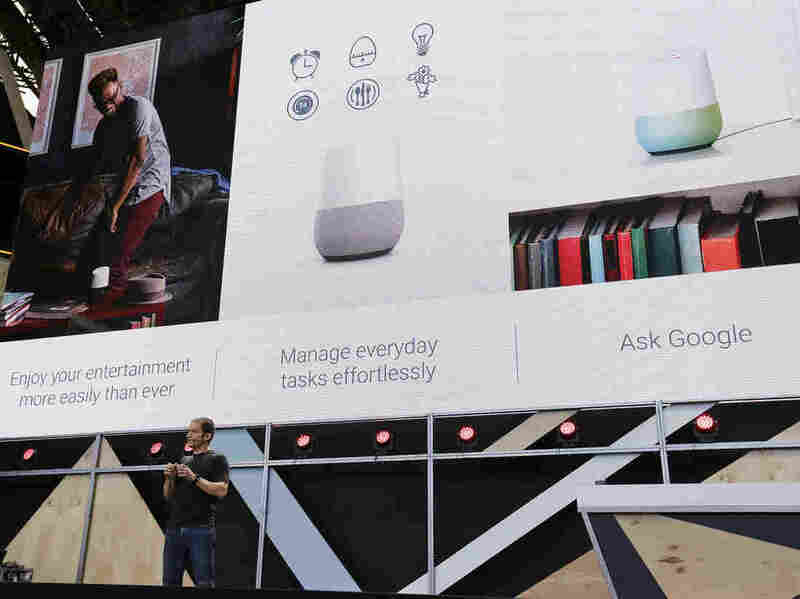 Google Vice President Mario Queiroz talks about the uses of the new Google Home device during the keynote address of the Google I/O conference in Mountain View, Calif.
We can do chatbots better than Facebook. We can be smarter at home than Amazon Echo. Our personal assistant gets trained on Google search, which is more widely used than Microsoft's Bing. We've got you covered on privacy; just like Apple, our new messaging service is getting end-to-end encryption. Well, it looks like Google won't stop bundling anytime soon. The personal assistant, which will work through multiple devices, is an effort to deepen the relationship with customers. "We want users to have an ongoing two-way dialogue with Google," Pichai said about the personal assistant. "We think of this as building each user their own individual Google." Already 20 percent of queries on Google's mobile app and Android phones are voice queries — people saying "OK Google" to summon an older assistant called Google Now. The company's been working for years to listen better — get what you say when you're in a noisy place, speaking slang like a human and not a robot, working to complete tasks. The assistant is being integrated into a new chatbot app Allo that helps you make dinner reservations or buy movie tickets. "It draws on 17 years of innovation in organizing the world's information to answer questions which are difficult for other assistants to handle," said Vice President Mario Queiroz.